"People are looking for new annual lines"
"Nigel Judd, Thompson and Morgan: "High popularity Cosmos Cupcakes"
"In general we see that people are looking for new annual lines. The Cosmos Cupcakes is such a new line and is very popular at the moment," says Nigel Judd of Thompson and Morgan, a British mail order seed and plant company. Not only at the California Spring Trials in the United States but also at the Flower Trials in the Netherlands, this annual caught the attention of a lot of growers. 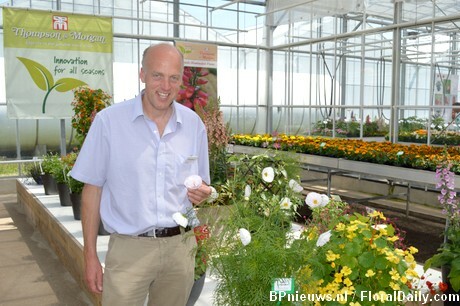 Andrew Spencer of Thompson and Morgan next to the Cosmos Cupcakes at the Flower Trials in the Netherlands. "The Cosmos Cupcakes is our biggest selling line in seeds," says Judd. According to him, the Cosmos Cupcakes is highly popular due to its petals. "There are no other plants with such an unique flower type; it is cup shaped and the outer petals are fused, forming a bowl. Some also have some extra petals in the center. 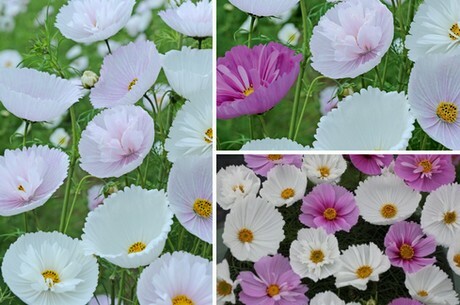 This Cosmos variety is available in three different color blends, mixes of white, pink and some with a dark eye. The Cosmos Cupcakes was the Fleuroselect Novelty Award winner in 2014," he says. Even though the Cosmos Cupcakes are as popular in Europe as they are the United States, there are still clear differences in noticeable preferences. According to Judd, many countries in Europe like plants with soft colors and small flowers while bright colors and large flowers are more demanded in the US. "The Illumination Flame in the digitalis series for example is by far the most demanded color in the US. In Japan, the Laurentina and other compact varieties are popular," says Judd. Thompson and Morgan breeds new plant varieties in the UK. "As we are part of a mail order company, we predominantly breed these varieties for the UK market. As a wholesale division, we can then take these varieties and sell them to other companies around the world, like seed packaging companies, brokers and growers. We also license some of our cutting raised products to companies who distribute them for us. The Buddleja 'Buzz, for example is bred by us and distributed by Proven Winners."